Feeling carnivorous? Maybe a little masochistic? Boy, do we have the video for you. Epic Meal Time -- every vegan’s favorite video team -- is back in action with their meatiest recipe to date. 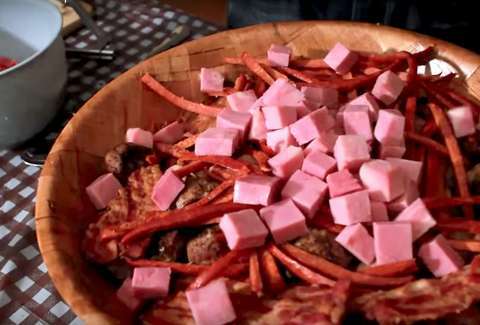 The “Meat Salad” is a gut-busting protein pileup where grilled flank steak stands in for lettuce, spicy pepperoni for carrots, meatballs for radishes, sausage for cucumbers, salami for tomato wedges, cubed ham for croutons, and chicken for, well, the chicken. And, because salads are nothing without a little dressing, the boys whipped up a creamy beer bacon number (complete with extra bacon bits for a much needed crunch) to drizzle overtop the finished monstrosity. I'm getting the sweats just thinking about it. Presented in a large wooden salad bowl, all those layers of grease and salt add up to a full 2,096 grams of fat and nearly 30,000 calories. Paging Dr. Atkins -- your lunch is ready. Meredith Heil is a staff writer for Thrillist. Yeah, she overdoes it. Yeah, that's tailored, homie. Yeah, she's overdressed and ain't no salad on me. Go hang a salami with @mereditto.